Fresh off a mock mission to Mars, SPACE.com contributor Elizabeth Howell will host an exciting "Ask Me Anything" session on Reddit today (Jan. 23) to answer your questions on what it is like to experience a simulated trip to the Red Planet. Howell will be available to answer Reddit reader questions at 12 p.m. EST (1700 GMT) to discuss her recent 14-day mission to the Mars Society's Mars Desert Research Station in Utah this month. A link to the Reddit AMA will be posted here at 11:30 a.m. EST (1630 GMT). 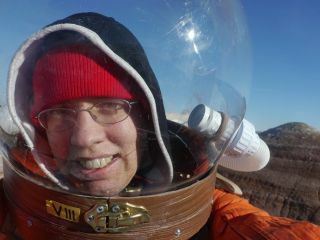 You can see Howell's photos of the mock Mars trip here. Howell even took questions from SPACE.com readers while living in the simulated Mars habitat during the two-week simulation. But now that she's back, we want to hear from you. What questions do you have about what life is like on a mock Mars mission, and what it could be like on a real trip to Mars? Tune in on Reddit at 12 p.m. ET to find out!